I am totally craving for some chocolate candy right now and if I had my pick, I would sink my teeth into a yummy crumbly Butterfinger! Why Butterfinger out of the many favorite chocolates on my hard-to-find chocolate list? Well obviously I love its delicious peanut butter plus rich milk chocolate taste so it was love at first bite for me. Peanut butter is also one of my weaknesses and coupled with creamy smooth chocolate; it simply spells scrumptious perfection! Anyway it's been years since I indulged my sweet tooth in a Butterfinger chocolate bar and since my last memorable bite, I've been constantly craving for this chocolate. Unfortunately for me, Butterfinger is not available at my side of the world. So usually, I'd get to enjoy another bite and taste when and if friends bring home this delicious chocolate delight for us from their vacation abroad. Before you ask, I did try looking for this chocolate on my last trip to Japan. Prior to that, we stopped for transit in Singapore and I made a quick frantic search for Butterfinger in Changi Airport but to no avail. That's two different countries I went out of my way to scour for this yummy chocolate and I still came home empty-handed. So until Butterfinger make its way to Malaysia, I shall continue my quest to satisfy my craving for yummy chocolates by visiting Sugar Stand. Stocked with all sorts of sweets, treats, candies and chocolates, this delightful online store offers over 2000 different candies in bulk quantities. Selections are continuously updated to include all the chocolate cravings in the world that you and I might have. And if I can't have the real thing, just looking at all the yummy chocolates and candies available at Sugar Stand is sufficient eye-candy for me! Thanks for sharing my morning choc chat here, have a lovely Wednesday. He he, I dropped 600 edi Mon but only dropped 50 so far for WOAFS hoho! U? It is sooooo yummy la, too bad we don have it here…sure I stock up if got here lol! I dunno if can finish for WOAFS la…trying here..
Wah ur almost done…. Dropping like mad panda now! Me too sweetie, bought ads edi too! Can zzzzz edi! So how's your raya preps coming along?? I am pretty much done.. just gotta go trim my hair a little, today. :) i've got my baju raya oredi!! yay! LOL! U edi in KK right Shemah? Then ur uncle’s place is where eh?? Anyway 7.30 am flight? Yowzaaaa! I managed to finish 900 drops Mon woo hooooo, now sure can sleep without worry he he….. 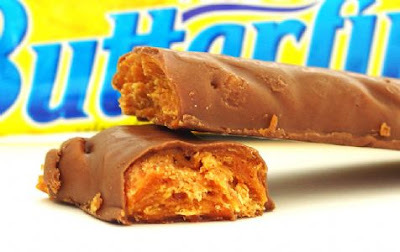 I'm more of a Mars bar kinda person but Butterfingers look really yummy. When will this be available here? I slept right after sahur yesterday dearie coz need to wake up early settle the motorbike.. fuyoo.. RM530 oh!! pokai!! plus lorry RM250.. aiyoo!! yummy.. making me hungry!! lol! Popping in to say sweet dreams!! it's 2 am here!! i never ever make FC!! It's simply impossible to beat you and now Bill is getting really good too!! you made me crave for one now. Raya is fast approaching and have you bought your shiny baju raya yet? Sedap tu. Lama rasanya tak ngunyah2 cokelat ni. Baca entri ni malam yang buat "craving" nak makan cokelat. Send me some butterfingers Bill!!! Hehehehhe! I love mars bar Nick!!! Seems like never la Nick..in Singapore oso I couldn find what more here huhuhuhuhu! Me too Liza, wish we had it here in Malaysia, so yummy! Same to u sweetie, thanks! Ur baby wants some choc Elai, enjoy! Thanks for popping in at 2am Jackie, hugs! LOL @ Bill is getting really good at chopping now hahahha! Me too ECL esp if got peanut butter oh so yum! Sasha!!! Miss u too sweetie…I oso love Butterfinger, can u get it where u’re at??? Ye ke Tekkaus?? I dunno we got local band called Butterfinger ha hah! Oh my I loooooooove Butterfinger Ayie! And ur so lucky cause u can buy it anytime u wan unlike me huhuhuhuhuhuhuhu…. I don like Snickers cause it has nuts in it Ayie, dats why I love mars bar…yummy!